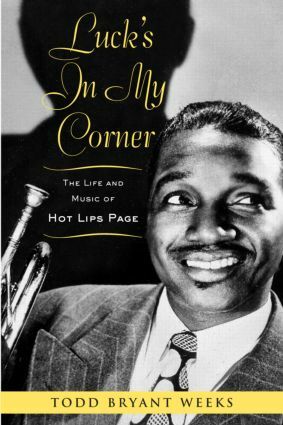 Luck’s in My Corner is a comprehensive biography of one of the most compelling jazz musicians of the Swing Era, Oran "Hot Lips’ Page. Page was the greatest of the Kansas City trumpeters, whose crackling, growling solos made him the go-to man during Count Basie’s earliest days as a bandleader. Page went on to be a featured trumpeter with Artie Shaw, a star of New York’s 52nd street, and a pioneer of the R & B scene of the 1950s. This book presents an in-depth chronology of Page’s career, with special attention paid to the development of his trumpet style. Luck’s in My Corner examines the life and music of a forgotten figure of the Swing Era and returns him to his rightful place as a leading light in the world of jazz. Todd Bryant Weeks has combined genealogical, musicological, discographical and historical research, resulting in a revealing and entertaining examination of a life that spanned major changes in American popular music. This book includes a new and complete discography by the author and dozens of unpublished photos.